Left: This Feb. 3, 2017, file photo shows Jemele Hill attending ESPN: The Party 2017 in Houston, Texas. Right: President Donald Trump waits outside the West Wing of the White House on Tuesday, Sept. 12, 2017, in Washington. For many people around the country, Monday, September 11, 2017, brought back powerful memories. It was a day to think back and reflect on the tragic moments of 9/11 sixteen years before. It was also a day for many in the southeast to evacuate their homes to find shelter from Hurricane Irma. 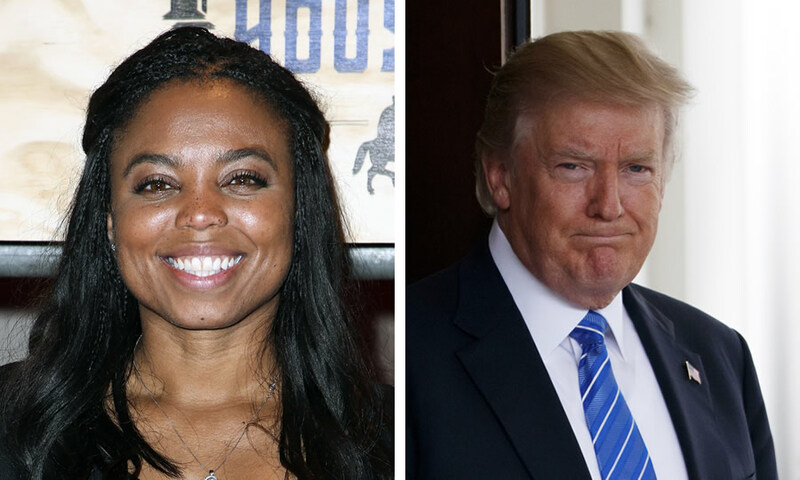 Instead, too many Americans got distracted by a tweet from ESPN Host Jemele Hill, blasting President Trump as a “white supremacist.” There was so much uproar over her statements that ESPN felt the need to issue a statement to distance itself from her claim. Ms. Hill later made a clarification herself, noting that she was expressing only her own beliefs. Of course, many supported Hill and felt that she did nothing wrong. Some blasted ESPN for not backing her up sufficienlty. Still others were outraged at Hill, and compared the slap on the wrist she got to the firing of sports commentator Curt Schilling last year for his conservative views. The inconsistency in how ESPN handles these kinds of issues was blatantly obvious. Celebrities like to shoot off their mouths. They always will. Rarely do they offer actual evidence for what they may believe. They fulminate, confident that most of their followers will share the same opinion. So they will not receive any thoughtful pushback. Too bad Ms. Hill didn’t take time to think through what she wrote. Maybe to ask an honest friend or coworker whether it was really a good idea. Whether, in fact, it was even true. Does she really, in her heart, even believe Trump to be an actual white supremacist? On what evidence? He has been seen showing love and respect to people that do not look like him. He has had many non-white friends over the years. Is he faking? So Ms. Hill may need to take a step back and think before she posts such inflammatory comments. President Trump should too. After Press Secretary Sarah Sanders made her statement during a press briefing, President Trump decided to tweet his own response aimed at ESPN. We all know that our President cannot let a moment go by without making a comment when he is criticized. Nevertheless, Trump should learn to let the little things in life move on, without feeling the need to respond to them every time. He has bigger fish to fry in the Pacific Ocean. If he knows that he is not a white supremacist, then the simple thing to do would be to make a quick statement saying that he is not one. He could further show his sincerity by asking the public to take heed to his actions which discredit the charge. Many may not like this next idea: he could take a play out of Obama’s old playbook. Trump could invite Ms. Hill to the White House and have a conversation with her about why she feels and believes the way she does. Now, that would be something: Trump puts the ball in Ms. Hill’s court and waits for her response! It could actually be a win-win situation for him. It would not matter if she came and spoke with him or if she declined to meet with him. Both scenarios could easily be spun into a good thing for his image. If she ultimately declined to meet with him, he could show that he tried to appease them. He tried to hold out the metaphorical olive branch and they did not accept. The liberal media did not want to meet with him and try to resolve issues peacefully. Well, it is something to think about. Click here to check out Jerome Danner’s website to find more on politics, social commentary, religion and his podcast. Follow him on Twitter or Facebook. Jerome, you offer us a script from Obama’s playbook, but what you are actually offering us is the approach and response of any academic, and let’s recall that Obama served as a professor of law—and I refuse to split hairs in entertaining arguments that his official status there was as a Senior Lecturer—at the University of Chicago Law School for a number of years before he entered the US Senate. Thus Obama’s playbook is the playbook of an academic; it is the playbook of someone who faces his opposition by trying to understand firsthand the nature and perspective of that opposition. In fact, much of what Obama did as a politician and as a leader stemmed from his professorial persona. He liked to gather people together and discuss an issue before he made a decision; and, yes, he liked to face his opposition up close so that he could learn from adversarial opinions. As such, Obama was not only a true academic but a true statesman as well; in fact, he espoused what John Stuart Mill advocates in his seminal work on democracy, the essay “On Liberty” (1859), which is a treatise on the rights of the individual; Obama believes, like Mill before him, that the dissenting opinion, oftentimes the minority opinion of an individual keeps alive the search for truth. Therefore, Obama, the academic, welcomed opposition and sought to understand it as a means to get to the truth of a matter. So, I agree with you that Donald Trump might benefit from “[taking] a play out of Obama’s old playbook.” However, in the course of doing so, I would hope that he would begin to see that the value and purpose of a college education is to form analytical minds that reach out to opposition as a means to find truth and to reconcile adversarial positions. It seems that some of the members of Congress might benefit as well from taking a play from the same old playbook and perhaps they, too, could learn about the value and purpose of a college education. Yes, Barack Obama, the college educated teacher and learner, used an approach towards problems and opposition that sprang from his analytical mind, a mind that was tuned and strengthened by his college education. I do hope President Trump and Congress take a play from Obama’s old playbook, and I hope they become advocates of higher education because the social well-being of our republic and the sustaining of our democratic way of life depend on our ability and our resolve to create lifelong learners of the highest measure. I state this in light of hoping and knowing as a college-level educator myself that the entire world becomes a better place when one person learns to use his reason and his virtues to solve our problems and to reconcile our differences. Seems the older I get the more immature public figures are getting. Before the Age of the Internet, most celebrities’ “deep thoughts” were filtered through a media handler. Some still are, but neither Hill nor Trump seem to avail themselves of this. Just blurting out the first thing that pops into your head is a thing that most of us learn to avoid sometime around kindergarten. The bubble that most of the famous inhabit seems to cause this talent to atrophy. Trump has tweeted many nitwitteries. Hill is only at this point catching up. Great piece! Why is is celebs think we all have a right to their opinion anyway? What makes their 2 cents worth some how carry more interest than anyone else’s? Of course, it might be the ego that drives them to seek status and celebrity in the first place… but no less chafing.